The umbilical vein offers a technically easy, relatively safe and pain free portal for intravascular catheter access in the newborn. 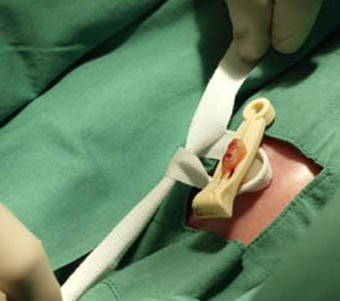 An umbilical vein catheter (UVC) provides a good alternative to a peripheral venous catheter that reduces the need for multiple procedures to maintain venous access while not being associated with greater risks of infection or necrotising enterocolitis.1 When the catheter tip is in a good position a UVC can be left in place for at least 14 days without increased risk of complications and one study suggests up to 28 days is safe. Butler-O'Hara et al,2 randomised UVC�s inserted at birth to either be replaced with a PIC line at 7 to 10 days or to be left in for 28 days. There was a non-significant trend to a higher infection rate in the longer duration group but no difference in other complications. Venous access from early after birth in all very preterm babies and any other baby requiring respiratory support. For urgent vascular access in resuscitation for administration of adrenaline or volume expansion. Infusion of hypertonic solutions for example in resistant hypoglycaemia requiring more than 10% dextrose or TPN. Blue sterile plastic sheet to place under sterile drape. protective goggles if open care. Perform calculation and/or measurement to estimate insertion distance. An approximation of the insertion distance in cms can be derived from the formula:3 (1.5 x birth weight in kg) + 5.5 . Select size 3.5FG double or single lumen UVC Use 5FG single lumen for exchange transfusion. 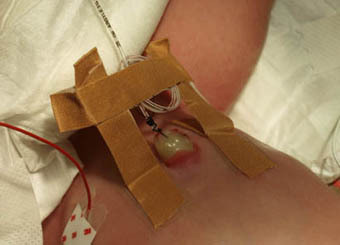 Prime the umbilical catheter with 3-way tap attached using heparinised saline (50 units per 5ml) and leave syringe attached. Prime both lumens where appropriate. Sterilise the cord and area around the cord with aqueous chlorhexidine. Do not allow topical antiseptic to pool under the infant, allow to dry for 3 minutes, then drape the area around the cord as shown. Remove first set of gloves. 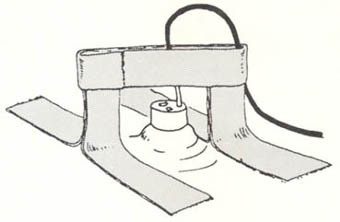 Place sterile cord tie around the base of the cord and tie in a loop with moderate tension (this is to stop back bleeding). 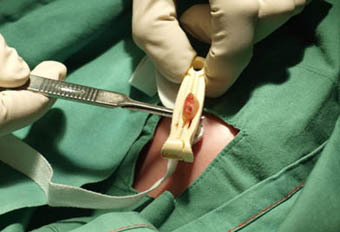 Use the scalpel to cut the cord between the cord clamp and the skin at the base of the umbilicus. Cut away from you and close to the clamp. Do not cut flush with the skin as this will limit any further attempts. 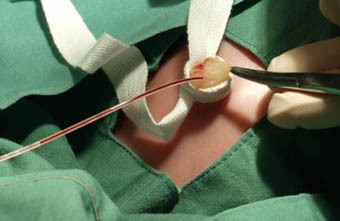 Examine the cut end of the cord and identify the two arteries (small, thicker walled and constricted) and the single vein (more gaping and thin walled). Grasp the edge of the cord with the suture forceps and use the lacrimal probe or the fine toothed forceps to tease open the vein. It will usually open up easily. Ease the catheter into the open vein and advance slowly to the estimated insertion distance. It will usually need only slight pressure to advance. Withdraw on the syringe to test whether you can get free flowing withdrawal of blood. If you can�t withdraw blood, it usually means the catheter tip is in the hepatic or portal veins, so withdraw the catheter slowly until you get free flow of blood. Anchor catheter to base of the cord with a 3/0 silk suture. Secure with �goal post� tapes as shown using Comfeel®. Connect catheter to infusion at 1ml/hr to keep catheter open until tip position confirmed with x-ray. Locate Catheter Tip on X-ray. If the catheter tip is too far in and in the chambers of the heart, measure the distance for an ideal position, withdraw and re-xray or ultrasound to confirm position. About 50% of UVCs will not follow the path into the ductus venosus and instead follow the hepatic or portal veins into one of the lobes of the liver. On x-ray, the catheter deviates off to one side into the liver as shown. In these situations, measure the distance to bring the catheter tip into a central position and withdraw. Locating UVC tip with Ultrasound. 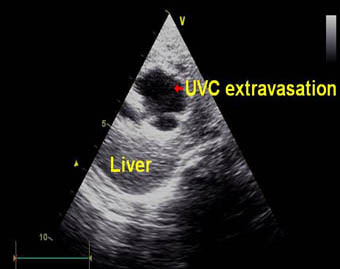 An UVC with the tip in a good position, e.g in the ductus venosus, IVC or low right atrium can be used for ongoing intravenous needs for up to 14 days. After this consideration for replacement with a PICC line should occur. An UVC with the tip in an intermediate or low position should not usually be left in situ for more than 48-72 hours unless the clinical situation is critical and there is no alternative secure venous access. These are the most serious complications and are potentially life-threatening. The two most serious extravasation sites are into the pericardium and within the liver. Cardiac Tamponade from extravasation into the pericardium: While more commonly reported from PIC lines this can occur with UVCs.5 Reported mortality from this complication is 50% and the mortality results from lack of clinical recognition. It can result when catheter tips are left too far into the heart, particularly if the tip abuts against the myocardium. With the repeated movement of the heart beat, the tip works its way through the myocardium and fluid is infused into the pericardium with resulting tamponade if not recognised. Prevention comes from careful location of the catheter tip, as above, and withdrawing catheters that have been inserted too far. Recognition comes from a high level of clinical suspicion and immediate access to point of care ultrasound. Typically these babies present with a relatively quick cardio-respiratory deterioration that cannot be explained. They are often misdiagnosed as suspected sepsis. 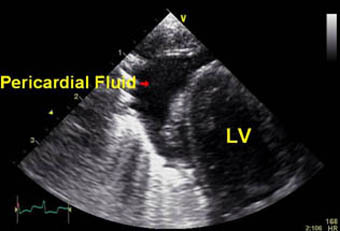 The chest x-ray may show a large heart shadow but ultrasound gives the diagnosis immediately with the characteristic echolucent fluid collection around the heart as shown. Management includes immediate cessation of the infusion and removal of the UVC. If there is significant compromise, perform pericardocentesis from the sub-xiphisternal position. 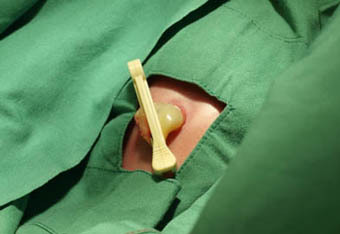 Ultrasound can be used to guide the needle during the procedure. 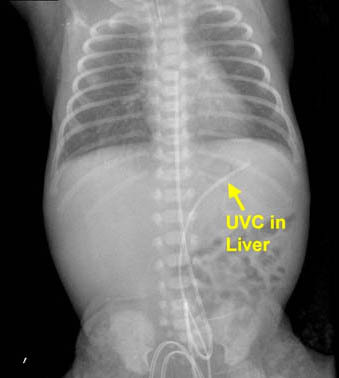 This occurs when the UVC tip is in the lower position in the hepatic veins.6,7 Experience at RPAH would suggest that this occurs when the UVC is left too long in these positions. Because of this, we would usually not leave a UVC in this position for more than 48 hours unless there are real problems establishing an alternative venous access. 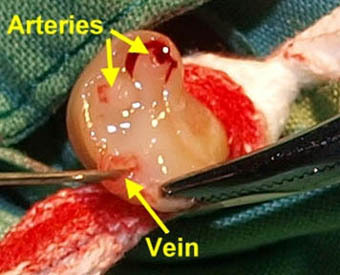 The extravasation will initially develop in the parenchyma of the liver forming a fluid filled cyst. This fluid will eventually track through the liver parenchyma into the peritoneal cavity resulting in ascites. Prevention is based on trying to locate the UVC tip through the ductus venosus and, when that is not successful, removing UVCs sited in the lower positions within 48 hours of insertion. The presentation of this is much more insidious than tamponade and will often present with mild abdominal distension in an otherwise well baby. The ascites may be apparent on x-ray but the problem is usually quite advanced by the time this becomes obvious. Early recognition depends again on a high index of suspicion and point of care ultrasound. 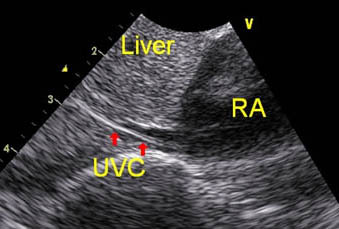 Subcostal views of the liver show the typical echolucent fluid filled cyst, often with brightly echo dense edges as shown in the figure above. Management is immediate cessation of the infusion and withdrawal of the UVC. Consider draining any ascites, particularly if there is a significant collection. If the infusate is hypertonic, then potentially this may draw fluid into the peritoneum from the vascular space, resulting in hypovolaemia. Thrombosis: Clinically significant thrombosis is uncommon but well recognised risk of UVC. Thrombosis of the inferior vena cava or the portal vein would create the greatest longer term risks. For this reason platelets or clotting factors should not usually be given through a UVC unless the situation is critical. Using data from an RCT of duration of UVC placement,8 univariant risk factors for thrombosis included haematocrit above 55%, small for dates and maternal pre-eclampsia. Of these, only haematocrit greater than 55% remained a significant risk factor on multi variant analysis. The infant is left clean and dry, check linen under the infant and assess temperature. UAC & UVC should be taped separately. 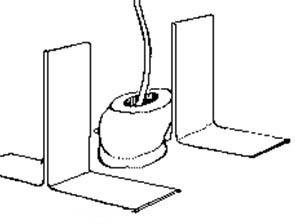 Loops should be secured by "cross" tape as a precaution against traumatic removal - see diagram below. Comfeel® is used to protect the skin and provides a barrier against epidermal stripping should the tape be removed in the first days following birth. Fix tapes as illustrated below. Post catheter insertion visualise stump, observe closely for bleeding. 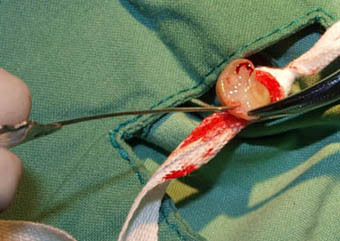 Umbilical tie (if used) to be removed when bleeding controlled to avoid possible skin necrosis. Umbilical stump (not skin) to be cleaned with aqueous chlorhexidine 0.015% solution BD (unopened bottle to be used for each invasive procedure and then discarded at 24 hours). Prophylactic heparin in central venous catheters reduces the incidence of catheter occlusion thus increasing usable life span of the catheter. Optimal concentration may be as low as 0.5 units/ml for intravenous infusion of TPN9 and results in less elevation of free fatty acids with lipid in fusions.10 Prophylactic heparin may reduce presence of fibrin clots thus reducing catheter related bacteraemia especially coagulase-negative straplylococci.9 It is not compatible with inotropes. Do not change inotrope solutions if the infant is unstable. Prepare IV solutions using sterile technique � sterile drape & gloves and the assistance of a second nurse. 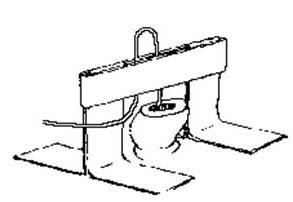 After the administration of blood & blood products consider replacement of 3 way taps & bungs. Use peripheral lines in infants > 27 weeks gestation (see small baby guideline). The infant should be nursed in the supine / lateral positions so that the insertion site of the UVC or UAC can be readily visualised. Nappies must be open if an umbilical arterial catheter (UAC) is insitu so that circulation to buttocks and extremities can be observed. NOTE: platelets may not be infused through central lines. Administer statim medications via the proximal connection to assure accurate dose. Consider use of peripheral lines in infants > 27 weeks gestation. Double lumen umbilical venous catheters are well tolerated for short term use, decrease the need for additional venous catheters in critically ill neonates and may not significantly increase the risk of complications when compared with single lumen venous catheters. When medications such as inotropes are ceased, the catheter lumen should be kept patent to facilitate future use of the secondary lumen. For example post inotrope infusion commence an infusion of heparinised saline 1 unit/ml (e.g. 27mls N/Saline / 10% Dextrose to 3ml heparinised saline) to infuse over 6 hours at the same rate the inotrope was infusing to ensure any vasoactive medications are slowly cleared from catheter (avoiding bolus to infant). Unused lumen to have 10% dextrose OR normal saline 1 unit heparin /ml infusing at a minimum rate of 0.5mls / hour to maintain patency of the secondary or distal lumen. 1hrly documentation of catheter position and security of H-tapes is required. As umbilical stump sloughs and separates the suture will no longer secure catheter, therefore H-tapes must secure catheter against movement or accidental dislodgment. 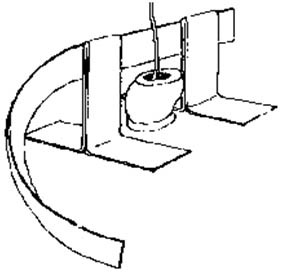 The Allaris volumetric pump (main lumen) should be at heart level and the pump zeroed at the beginning of an infusion, change of administration set or if the set is removed from the pump for any reason � document same on the Intensive Care Chart (MR581) or High Dependency Chart (MR582). See section Prevention and Recognition of Extravasation below. The volumetric infusion pumps have a default setting of 75mmHg when turned on. This needs to be reset to an appropriate alert limit when commencing an infusion and at the beginning of each shift. It should be remembered that low infusion volumes require tighter alarm alerts to detect early extravasation. A study by Guy & Pons de Vincent (1992) recommended that for peripheral lines the optimal pressure limit above baseline should be set at 30cms H2O that is 22mmHg.17 There has been no such study with respect to central lines. The RN should initially set alarm limit at 25mmHg above baseline and adjust same according to changes in hourly rate / volume. Variability in pressure readings is common in the neonate. Increase in pressure readings may be due to extravasation of the catheter into the vessel wall or liver but more commonly results from a change in the height of the infusion pump with respect to the infant, the behavioural state of the infant or addition of side lines to administer medications or fluids (increase in volume). Conversely a fall in pressure readings may also indicate extravasation, leaking connections, dislodgement, a perforated line or a change in the position of the infusion pump. While changes in pressure readings do not necessarily detect extravasation, it is essential for the RN to inspect and evaluate the umbilical site and volume infused in response to pressure readings trending up or down. It is recommended that ALL changes in pressures readings above OR below 30mmHg be investigated and action documented on the fluid balance / intensive care charts (MR662B ) or High Dependency Chart (MR582). Assessment of change in the condition of the infant such as onset of hypoglycaemia, metabolic acidosis, hypernatraemia or signs of dehydration. 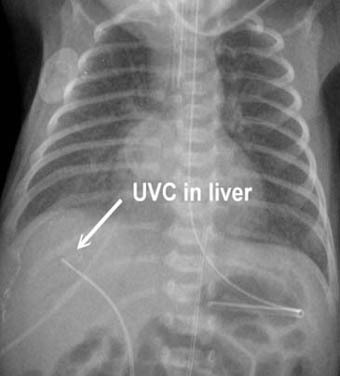 These signs have been associated with extravasation of UVCs. The UVC may be removed by a CNS when the registrar/fellow is in unit. Consider removal of the UVC as soon as its use is no longer clinically indicated. 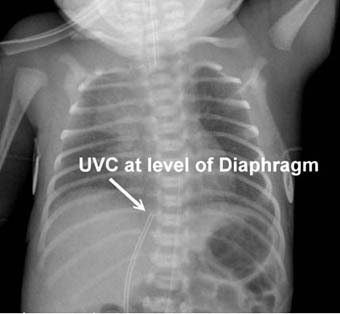 The UVC may remain insitu for up to 14 days without complication. The registrar/fellow should plan to site a percutaneous central venous catheter (PIC) for infants who require ongoing central venous access prior to removing the UVC. Universal precautions include the wearing of protective goggles when UVCs are removed on an open care cot. 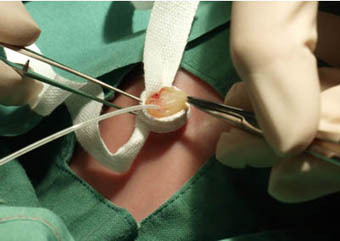 Cut suture / remove tape � Note: in some instances UVC is removed with UAC remaining insitu. Care must be taken not to dislodge UAC. Ensure H-tapes remain firmly secured to the skin. Control bleeding by applying gentle pressure superior to stump site for 5 minutes using sterile gauze. 2. Butler-O'Hara M, Buzzard CJ, Reubens L, McDermott MP, DiGrazio W, D'Angio CT. A randomized trial comparing long-term and short-term use of umbilical venous catheters in premature infants with birth weights of less than 1251 grams. Pediatrics. 2006; 118(1): e25-35. 3. Shukla H, Ferrar A.� Rapid estimation of insertional length of umbilical catheters in newborns. Am J Dis Child 1986; 140: 786. 4. Ades A. Sable C. Cummings S. Cross R. Markle B. Martin G. Echocardiographic evaluation of umbilical venous catheter placement. Journal of Perinatology 2003; 23(1): 24-8. 8. Narang S. Roy J. Stevens TP. Butler-O'Hara M. Mullen CA. D'Angio CT. Risk factors for umbilical venous catheter-associated thrombosis in very low birth weight infants. Pediatric Blood & Cancer. 2009; 52(1): 75-9. 9. Shah PS, Shah VS. Continuous heparin infusion to prevent thrombosis and catheter occlusion in neonates with peripherally placed central venous catheters. Cochrane Database of Systematic Reviews. 2005;(3): (CD002772). 10. Spear M, Stahl G, Hamosh M et al. Effect of heparin dose and infusion rate on lipid clearance and bilirubin binding in premature infants receiving intravenous fat emulsions. J Pediatrics. 1988; 112: 94 � 98. 11. Mark B, Salzman M, Larry G, Rubin M. Relevance of the catheter hub as a portal for micro-organisms causing catheter-related blood stream infections. Nutrition. 1997; 13: 15S-17S. 12. Garland JS, Buck RK, Maloney P et al. Comparison of 10% providine-iodine and 0.5% chlorhexidine gluconate for the prevention of peripheral intravenous catheter colonisation in neonates: a prospective trial. Paediatic Infect Dis J. 1995; 14: 510-516. 16. Alaris Medical Systems, Inc. (2003). Signature Edition� GOLD Infusion Pump (Models 7130/7131 and 7230/7231. Directions for use. San Diego, California: Alaris Medical Systems. 17. Guy B. & Pons de Vincent JF. Value of approach monitoring of infusion pressure in neonatology. Pediatrie 1992; 47(6): 487-492.